The second season of "The Orville" will premiere on Fox on Dec. 30, 2018. Science fiction is back in vogue, there's no doubt about that. And about time too, quite frankly. In the first few weeks of 2019, sci-fi fans will be able to enjoy the second season of both "Star Trek: Discovery" and "The Orville." Plus we have season two of "Lost in Space" to look forward to later in the year. The show's creator, Seth MacFarlane, is a self-confessed Trekkie and has even appeared in two episodes of "Star Trek: Enterprise" ("The Forgotten" season 3, episode 20 and "Affliction" season 4, episode 15). Like so many of us, MacFarlane grew up watching "Star Trek: The Next Generation" as it aired in the late 80s and early 90s and that has certainly influenced how the "The Orville" looks. "It's a love letter to 'The Next Generation,'" said Mark Jackson, who portrays Isaac on the show. "I think it's a really beautiful thing. Seth has captured the best elements of that show and transported them into 'The Orville' and made it a different show." Isaac is the Orville's science and engineering officer – in essence, the role he plays is akin to Spock or Data in the bridge crew. Isaac is a member of an artificial, non-biological race from Kaylon-1 that views biological lifeforms, including humans, as inferior. He accepted the position on the Orville because he saw it as a way to study human behavior. "I think most of the humor in 'The Orville' is not derived from a parody of 'Star Trek.' I think its humor that stands on its own feet," says Jackson. "I think it's humor that comes from observing the daily life of the star ship in the future; the boring bits, the bits you don't tend to see on screen where people have bad hair days or badly behaved children or burn their dinner. It's those mundane daily activities that 'The Orville' captures so well and that's where a lot of the humor comes from." Jerald has an extremely impressive list of acting accolades and she's no stranger to Star Trek, she played Kasidy Yates, the future Mrs Sisko, in "Star Trek: Deep Space Nine." Anything can happen in science fiction and adding comedy to the mix opens up even more creative possibilities. In season one, Dr Finn has a relationship with one of the ship's crew, Lieutenant Yaphit. So how does a Juilliard trained actor prepare for an intimate scene with a sentient gelatinous blob? "Oh my gosh, it was so much fun," Jerald laughs. "It was really a learning experience for me because I had never experienced on camera shooting with something that's not there and will be put in later." "I had no idea of how it would turn out, it was a trust factor for me. I truly had to trust Seth and our director at the time. So when they scream, 'More tongue!' I have to understand that that's exactly what is needed, even if I'm questioning, 'Are you kidding me?'" Science fiction comedy is a niche sub-genre that tends to end only in great success or abysmal failure. Notable success on both TV and the big screen include "Red Dwarf," "Futurama" and "The Hitchhikers Guide To The Galaxy" plus "Mars Attacks," 'Men In Black" and of course, "Galaxy Quest." Galaxy Quest, which starred Tim Allen, Sigourney Weaver and Alan Rickman, poked a friendly finger of fun at the first series of "Star Trek" and the subsequent movies featuring the original cast. In the movie, the helmsman of the NSEA Protector, Tommy Webber (played by Daryl Mitchell), has to remember how he had pretended to steer the ship using the studio set helm controls. "That's so funny that you say that because his line in Galaxy Quest as he sits at the console is 'I remember this! I remember I had it all worked out' and that's almost verbatim what I said coming back for season two. I'm telling you I had it all worked out," laughs Scott Grimes, who plays Lt. Gordon Malloy, the helmsman of the Orville. "I was like, 'I have got to work this out' because there are people out there that will watch the show and say 'every time he goes to quantum drive you do the same thing' and I say 'you're damn right I do because there are people saying I won't.'" So every time Capt. Ed Mercer (played by MacFarlane) orders the Orville to travel faster than light, we the fans need to watch closely to which buttons Lt. Malloy presses on his helm control. The Orville is more than a love letter to just "Star Trek: The Next Generation," it's a love letter to all good sci-fi comedy, including "Red Dwarf." In "The Orville" episode "Firestorm" (season 1, episode 10) a little "Space Corp Directive" mis-quoting humor makes an appearance and the actor Lenny von Dohlen has even appeared in both series. However, it's essential that "The Orville" also retain its own identity. "We've had a couple guest actors that were on Star Trek. I don't want that to continue too much," says Grimes. "Like let's say Patrick Stewart who I do American Dad with, so he has a relationship with Seth. I don't know if it would be good to have Patrick on the Orville because then I think that takes you out of the reality that we are trying to create on the show. You know, you try so much to create a show that people are weighted in and I think that would go a little to far." Season one of "The Orville" was a huge success and fans are clamoring for more. Ever since 1999, we all wanted to see the continuing adventures of the crew of the NSEA Protector and "The Orville" has finally more or less given us that. 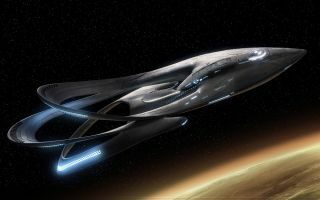 The first season of "The Orville" is available to watch for a limited time on Fox.com in the US. A season pass can also be purchased from Amazon. The second season of "The Orville" will comprise of 14 episodes. It will premiere on Sunday, December 30, 2018, in the US and Canada and in the rest of the world on Friday, January 7, 2019. Follow Scott Snowden on Twitter. Follow us @Spacedotcom and on Facebook. Original article on Space.com.